The IELTS or International English Language Testing system is conjointly managed by the British Council, Cambridge English Language Assessment and IDP Education Australia. The IELTS is accepted by a majority of higher education establishments in the English-speaking world and schools offering international studies. 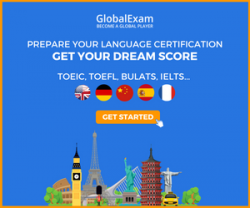 It is the main competitor to the TOEFL in many aspects insofar as the difficulty level is comparable, and both vie for the first place in popularity, and they both serve the same purpose: Testing students ability to study in English. One particularity of the IELTS is that speaking exams take place during an interview in front of the examiner, whereas the TOEFL spoken English test is recorded and assessed later. Every candidate must choose between the General Training module and the Academic module. You will most likely choose the later as it will give you access to higher education in English. The General Training will be of interest for those seeking to gain work experience or for immigration purposes. The IELTS costs $190 and is considered valid two years unless the students prove that they have worked to maintain their level. Four communication (skills, speaking, writing, listening and reading) are assessed and given a score from 1: “non-user” to 9: “expert”. All in all, the test takes about 3 hours. Cambridge English Language Assessment is part of the university of Cambridge. They have been providing English language tests and qualifications for more than a hundred years. They were involved in the creation of the Common European Framework of reference for languages (CEFR) and its examinations are aligned on it. As stated above, the institution manages the IELTS conjointly with the British Council and IDP Education Australia. Besides this very popular test, Cambridge provides several high ranking diplomas that benefit from the aura of the university. They are called the Cambridge English examinations or sometimes just the Cambridge, which might lead one to think that there is only one diploma. Those tests procures a qualification. Consequently, they do not have a validity time and do not get obsolete. Diploma means it is possible to fail the examination. Candidates will have a grade from A to E. They will pass if they get a grade between A and C and fail if they get a D or a E. However, all candidates receive a Cambridge Statement of Results with their results and their CEFR level. Each certificate corresponds to a CEFR level: However, if you get an average grade it is possible to get the CEFR below the level of the certificate. On the other hand, it is possible to get the level above if you do extremely well. The Cambridge is divided in four parts: writing, reading and language use (grammar, vocabulary and collocations), listening and speaking. The speaking is taken face-to-face with two candidates and two assessors. Only one of the assessors ask questions and interacts with the candidates. Their speaking skills are both evaluated in interaction and in monologue. The pricing is around 220 euros but diplomas do not expire. Cambridge also provides the Business English Certificates (BEC) that aims to assess the students’ skills in professional context and may be required by some MBA.